Great Commission Missions Inc. began with a mission trip to Malawi in 2000. God brought together a grandmother from Oklahoma and 12 year old girl from Misi Village. From that moment, a seed was planted that was nurtured by the Lord. A trip back to Malawi in late summer 2005, revealed the severe conditions and hunger and brought together two couples who became burdened for the orphans. Many of these children were eating maybe one meal every three or four days. Early that next year, they decided to feed some of those hungry orphans. Much prayer and brainstorming became the order of the day. On Good Friday 2006 Grace Feeding Center, GCM's original name, began feeding 30 children one meal a day. We were amazed at the growth and support as we followed God's leading. "Now to Him who is able to do far more abundantly beyond all that we ask or think, according to the power that works within us, to Him be the glory in the church and in Christ Jesus to all generations forever and ever. Amen." Ephesians 3:20-21. The vision grew and more people got involved. In 2007, we began the process of incorporation as a 501(c)(3) non-profit organization and Great Commission Missions Inc. was officially feeding orphans in Africa. Over the past five years, the Lord has expanded the territory. Now GCM is feeding over 700 kids each day at three locations and the numbers grow almost daily. 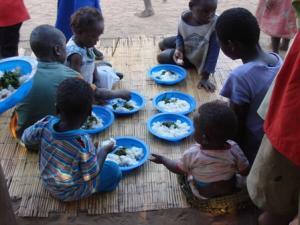 We have learned over these years that being fed is an enormous concern to many children, not just orphans. Because of this GCM has endeavored to feed many children that we call "specifically designated." 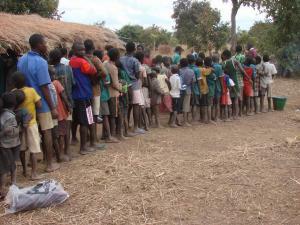 In Malawi, many children have parents that may have full-blown HIV/AIDS or have tested positive. Many of these kids live in destitute conditions as well. These children have little hope of eating nutritious meals, unless provided by generous people who will partner with them. Not only will they lack food but it is well known that they will not do well in school either. For these children, this will probably be the case in Malawi for many years to come. GCM has acquired land donated by Village Heads and put in the name of GCM at both Mfelakake and Kasipa villages. A third plot of ground is being considered by the Malawi Government as a donation and permanent location for the purposes of feeding the children of the Misi area and providing a place for worship, instruction and outreach. We also pray for the funds to operate a Malawi-style technical trading center to train the children in the four basic building blocks of Malawi: 1) cooking; 2) gardening; 3) carpentry; and 4) sewing. Equipped with these skills any child would be able to survive life in this homeland. In July 2010 we were able to provide two water wells for clean drinking water in two of our locations. Since water is always an issue in Malawi, the women and children may walk many kilometers for this precious commodity. If GCM is able to obtain the land mentioned for Misi, we will just need to repair the water lines. Food as well as water is necessary for life and by providing these essentials GCM is better able to share the Gospel, the story of Jesus who is necessary for Eternal Life. "Malawi is heavily dependent on foreign aid, with donor funding accounting for more than 40 percent of the government's receipts. Former colonial master Britain is Malawi's single largest bilateral donor. … A donor squeeze and question marks over the future of tobacco exports, which account for 70 percent of foreign exchange earnings, could hit growth and put the currency, the kwacha, under pressure." Aside from Madonna you have probably never heard of it, and if you have, could not point to it on a map. Malawi is a wonderful part of the world with great people and a place where God is working. GCM is honored to be part of this work.